A World Wildlife Fund report has identified marine areas of Northern Ireland as being in need of immediate environmental protection. 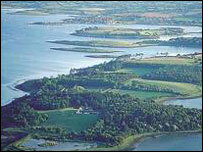 Larne Lough, Strangford Lough and Rathlin Island were all featured in the UK-wide study. The report was produced by the Marine Biological Association to examine threats to marine habitats. They have previously been identified on land, but it is the first time hotspots have been identified at sea in the UK. 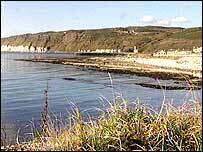 Rathlin Island was chosen as one of the five case studies in the report for its 143 sponge species (almost one third of all the sponge species found in the UK) and burrowing anemones. Strangford Lough was also identified as a "hotspot"
Recent surveys have discovered 15 new sponge species which are globally unique to Rathlin. Malachy Campbell, from the WWF, said identifying the hotspots should help the government to come up with the required legislation to protect them. "Over half of Northern Ireland's wildlife lives in our seas and yet only 4% is protected," Mr Campbell said. "With increasing pressures on our seas from a range of activities including fishing, shipping, dredging and energy generation, we need to ensure there is adequate planning and management of these activities. "A robust Northern Ireland Marine Bill, as part of the UK Marine Act, is necessary in order to better manage these pressures and meet these challenges." The Alliance Party's environment spokesperson Councillor Stewart Dickson said the government should "sit up and take notice" of the report. "All these places are areas of real significance as regards tourism and the environment," Mr Dickson said. "We need to see the creation of an independent environmental protection agency as soon as possible so that they can clamp down on polluters."